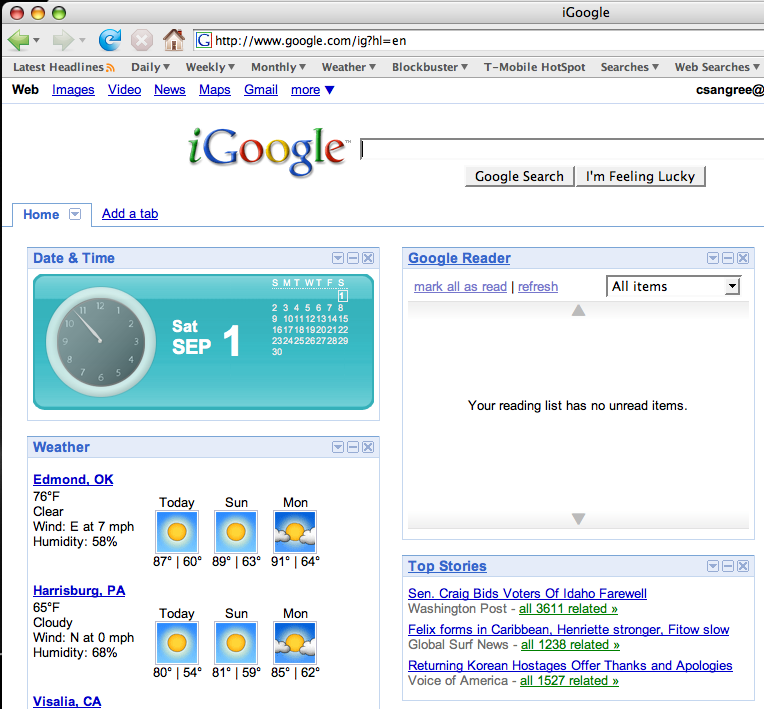 So today I was just really enjoying the genius behind Google’s homepage and blog reader. I regularly follow probably about 50 blogs and it’s just awefully hard to keep up with them all if you have to actually visit the blogs regularly to check for new posts. Here’s a look at what my homepage looks like. As you can see, my Google Reader is empty because I just read the 10 new blog posts that were waiting for me after I got back from this afternoon’s photo shoot and the OU/UNT football game. I absolutely love when technology actually makes life more efficient. Much of what Google has to offer actually is worthwhile and I’m surprised it took me this long to use iGoogle as my homepage. My Yahoo home page is now officially retired. Thanks, Yahoo, it was a good, long run. You may already know this song well, but it’s really grown on me in the last couple of weeks. It’s called “Signature of Divine” by Needtobreathe and you can listen to it here. It’s awesome!